No room for shrinking violets here with this necklace by Hot Tomato - just a glorious riot of vibrant colour fit for a Caribbean Queen. 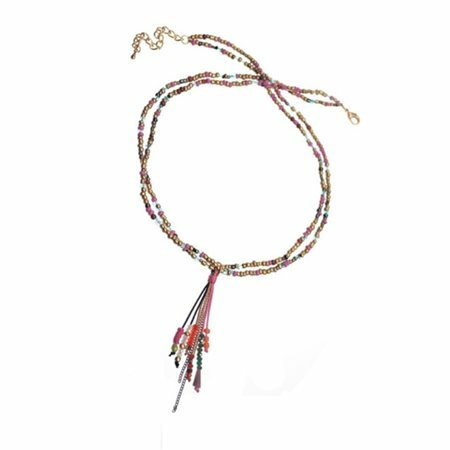 Two single runs of crystals and beads warmly interspersed with old gold, showcasing a fabulously flattering tassel of more colourful surprises. Fastened with a lobster clasp and extender chain. A veritable feast for the eyes roll on summer! No room for shrinking violets here with this necklace by Hot Tomato - just a glorious riot of vibrant colour fit for a Caribbean Queen. Two single runs of crystals and beads warmly interspersed with old gold, showcasing a fabulously flattering tassel of more colourful surprises. Fastened with a lobster clasp and extender chain. A veritable feast for the eyes ��� roll on summer!